FullShot Version 10 builds on the powerful capture capabilities of version 9.5 and adds a new My Work workflow so you never lose an important screen capture. Version 10 is also fully compatible with the latest version of Windows 10. This version also enhances the functionality of callouts and annotation tools, bringing new highlighting functionality while retaining all of the powerful capture and editing capabilities of the Version 9 series of FullShot. With a completely redesigned interface, FullShot presents all of the power in a simple, integrated environment. Windows 8, 7 and Vista Compatibility. Improved Object capture and region capture interface with clearer sizing and positioning display. Certain callouts now have an extra "tail" that can be dragged around like the original tail. Dragging objects across a document tab now brings that document to the top of other documents for easier access to Drag-and-Drop. Dragging objects can now scroll the document automatically. Scaling can now be automatically applied to an image as it is captured. A new context menu is available when an object is selected and right-clicked. The Black & White capture option has been brought back. Several known issues were resolved. Desktop Ruler useful for measuring window sizes. Top/Center/Bottom vertical alignment options for text and callouts. 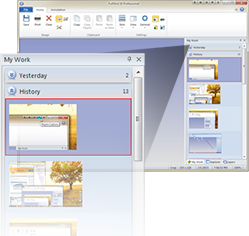 Improved handling of certain third party XP Themes when skinning Snapshot Buttons. Addressed certain issues with Flash Exporting. Addressed certain issues linked with printer loading. Addressed issues with capturing on certain multi-monitor configurations. Reintroduced the colored document tabs from version 8.5. Object capture with overlapped capture. Two new bracket drawing objects. Completely redesigned interface with integrated editing ability. Annotation Objects pane for ordering and selection of individual annotation objects. Redesigned Callout look and feel with anti-aliasing. Copy & Paste support for Annotation objects. More intuitive, redesigned crop interface. Easily accessible font and font size drop-downs. Fully customizable workspace, toolbars, and docking windows. Allows creation of empty canvases. New Object capture mode that recognizes list items, desktop icons, toolbar buttons, and other items. Captures details like tooltips more effectively. Captures transparent windows more effectively. Pixel-Perfect Printing technology for crisp prints optimized for screen capture images. DPI-accurate printing for exact screen to paper measurements. Enhanced multi-print mode with adjustable amount of images per page.